With the New Year picking up speed and the passed year quickly dissolving in our memory, I want to take this opportunity to recap on a couple of remnants from 2011. In the following 2 posts, focusing on Colombia, the home country of our widely discussed Medellin, I want to share a quick glimpse on 2 specific leftovers from 2011. Yes, 2011 culminated with yet another mobility innovation in Medellin. 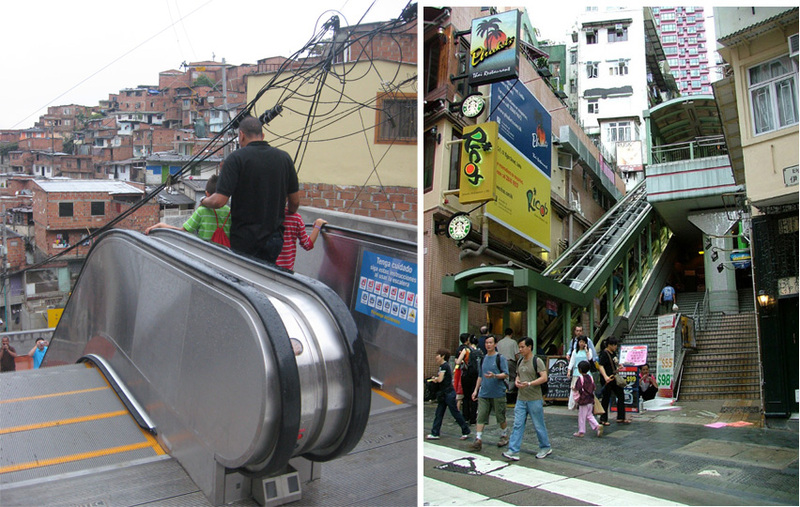 Adding to the existing list of Metrocable (in Medellin; Caracas and now Rio), elevators, and monorails, we have now a new mechanical tool for pedestrian circulation: exterior electric staircases. Although not the first exterior electric staircases(see: Honk Kong), this is he first of its kind being located in one of Medellin’s most difficult informal settlements. 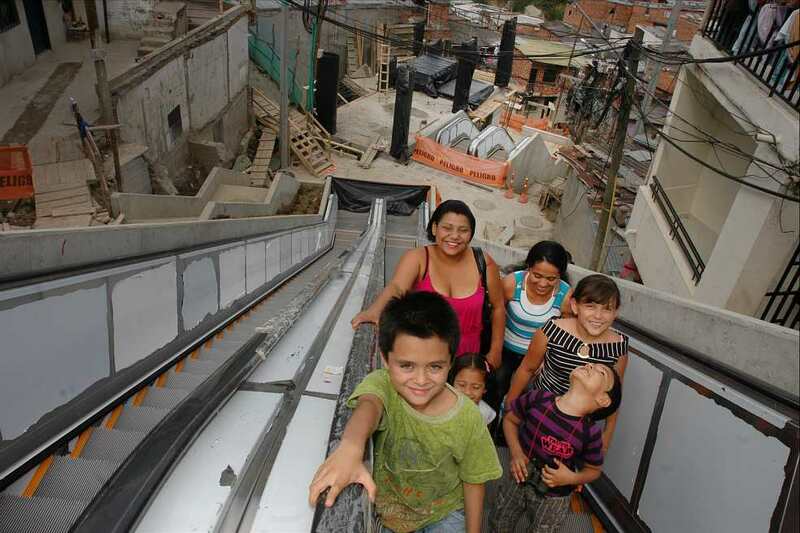 The stairs are being built in the informal settlement Las Independencies (12 000 residents), located in the Comuna 13 as part of the Comuna’s PUI (part of a group of interventions including a Library Park: Parque Biblioteca San Javier , and the city’s second Metrocable). The electric staircases, imported from Japan, were inaugurated in December 2011, costing 13500 million Colombian Pesos (approximately 7.6 million USD). With 130 linear meters, covering an area of 2000 sqm and replacing over 200 steps, the mechanical staircases climb- through 6 separate segments- 38 m in height. Moreover, a friend who recently visited the area told me she went on a rainy day and since the stairs weren’t working, she stood in the middle of muddy road (as the access roads to the staircases have not (yet ? )-been paved) surrounded by a group of very disillusioned tourists. The staircases are accompanied by other interventions comprising close to 3345 sqm of ‘green and public space, aiming to strengthen and better the life of surrounding residents.’ Contingent on this, a resident interviewed stated that this will be a very beneficial project for the neighborhood as it will bring a lot of tourism, and will end the violence.’ Indeed the staircases have been stipulated to help the security of the area, residents believing that as a new tourism spot, more police will be present in the area. Issues regarding accessibility for people with disabilities, poverty voyeurism (ROCINHA), as well as the long-term sustainability of the project including material and project maintenance, and operational costs are sure to come up. Accompanying the staircases, 2 buildings will be constructed in order to house police stations, a social justice post and an INDER (institute for sport and recreation). This brings up more questions: Are local residents getting trained to help with the operation and maintenance of the staircases? What type of socio-economic programs will be implemented in the area (apart user training programs that will take place in order to teach residents how to ‘appropriately’ use the stairs) in order to train and provide new opportunities for residents? Although it is too soon to judge the real impact of these electric staircases, we can- and should- once again, stress the importance for post-construction and user evaluations, to evaluate the outcome and long-term impact of the intervention… I realize that I have said this in other posts, but before cutting the ribbon for a new shiny and innovative project, we should consider whether or not we are simply imposing an image of social good or truly responding the politics of place and socio-economic realities of the area. Adri thanks for this post, this is indeed a very interesting and innovative intervention that is worth evaluating. I have already started a campaign with fellow academics to see if someone is up to it. Let’s follow up on our side, to see how the rest of the project advances and how the community is reacting to it. Thanks for the comment. I agree, and think that it is an interesting project to follow-a MUST as far as post-occupancy impacts and evaluations. Let me know who takes it on! 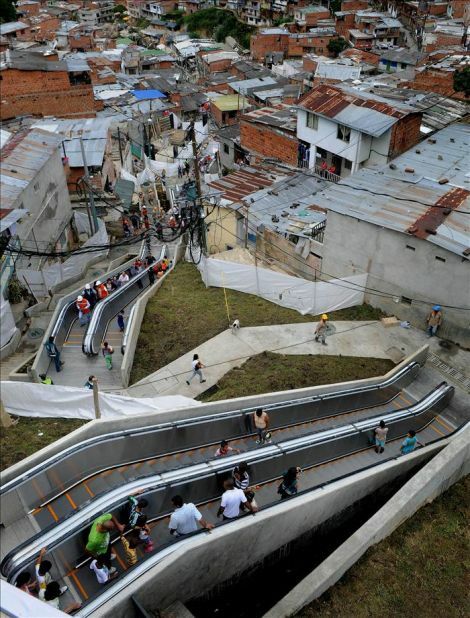 I often wondered about the viability of out-door escalators when thinking about mobility infrastructure in informal settlements. I first, didn’t know if escalators could withstand rain, mud and other debris. I guess this means they can? How does a network of escalators compare to gondolas in terms of maintenance and building costs? Do you know about what kind of decision making process leads planners to build escalators over the gondolas? Do we know which is more ‘cost-effective’? These are great questions, and I am actually trying to find more concrete answers. Just by curiosity, here is a quick cost comparison between a Metrocable (aerial gondola system) and the stairs. 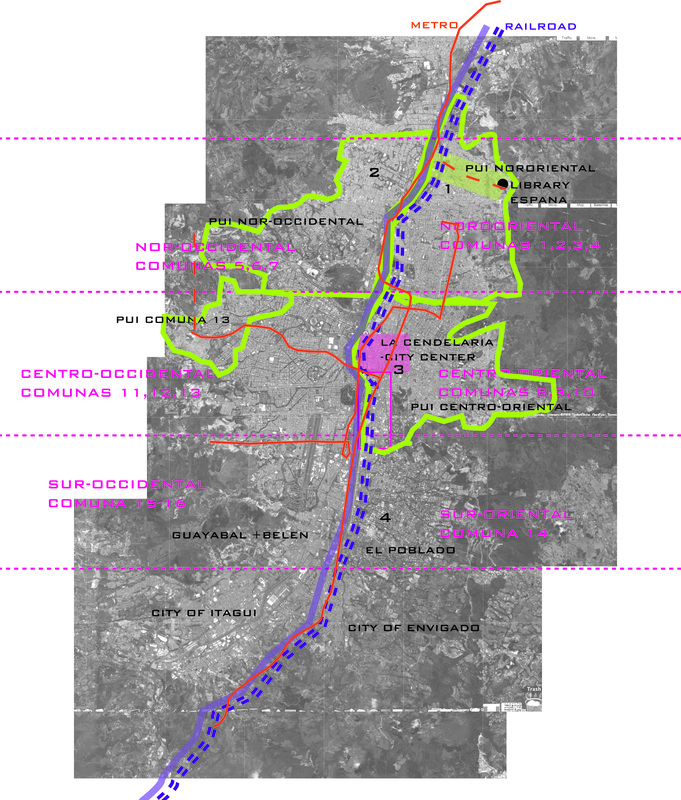 The Metrocable Santo Domingo- or Line K-was the first line to be built in Medellín (opened in 2006). It is 1.8 km long, covers 399 m in height and contains four stations: Acevedo, Andalucia, Popular, and Santo Domingo. So it seems that as far as pure cost effectiveness, the Metrocable- even thought it is an expensive infrastructure investment in itself-is a better bet. Still, there are still questions on maintenance and operations costs, comparisons in daily capacities, the distance between points of access (in this regard, the electric stairs provide more points of access in a reduced area), as well as other less quantifiable benefits such as the range of accessibility (for example concerning handicap users). As far as weather protection goes- the renderings show the stairs with a cover, yet, there seems to be not structure – or beginning of it- hinting towards one in the actual intervention. I am assuming they are designed and built withstand exterior conditions, yet we are sure to find out soon… For now, all I know is that good friend visited on a rainy day and the stairs weren’t functioning.